Historic Finger Lakes Inn 1922 Starkey House, provides the ideal location for adventurous hiking around Seneca, Keuka, or Cayuga Lakes. In fact, it's location just north of Watkins Glen and 20 miles south of Geneva, is central to most trails for a day excursion. 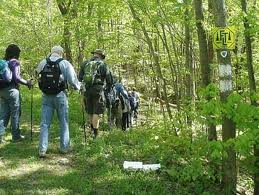 While researching for information to pass on to my hiking guests I found a "mother load" of information on the Finger Lakes Trail Conference website. There is an interactive map that is most helpful and the site is user-friendly with descriptions and answers to all of your hiking questions. I am also conjuring up more extreme and hearty breakfast ideas to add to my delicious repertoire of nutritional delights everyone looks forward to. All of my hiking and biking guests have declared my dishes to be tasty, filling, and long-lasting, containing all the stuff necessary for the energy they need for their excursions. Now tell me this does not look appetizing!